Professor Spalding was born in 1923 in New Malden, England. He obtained his BA in Engineering Science from Oxford University in 1944, an MA from Oxford in 1948 and his PhD from Cambridge for a thesis on The Combustion of Liquid Fuels in 1952. In 1954 he was invited to join Imperial College as Reader in Applied Heat and in 1958 was appointed Professor of Heat Transfer. He was subsequently Head of the Computational Fluid Dynamics Unit at Imperial and held both positions until his retirement in 1988. He was visiting Professor at MIT, University of California, Berkeley, University of Minnesota and Reilly Professor of Combustion at Purdue University. 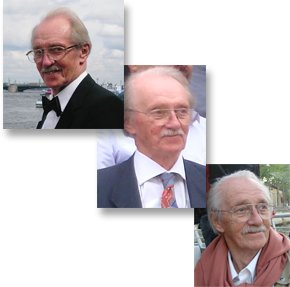 Professor Spalding’s scientific publications since 1949 include papers on thermodynamics, combustion, heat transfer, fluid flow, turbulence models, boundary-layer theory and computational fluid dynamics. In 1974, Professor Spalding founded Concentration, Heat & Momentum Limited (CHAM) and was its Managing Director. Its major product is the widely-used, general purpose, PHOENICS computational fluid dynamics (CFD) code, of which Professor Spalding was the main creator and developer. Until his unexpected death in November 2016 in his ninety third year Professor Spalding explored computational fluid dynamics with undiminished vigour. He enjoyed working seven days a week with time out for speaking at Conferences where he could meet colleagues and students and discuss matters of mutual interest hopefully resulting in mutual enjoyment. He also found time to read (poetry and prose) and write (lectures and poetry). D. Brian Spalding was awarded the 2010 Benjamin Franklin Medal in Mechanical Engineering for his seminal contributions to the computer modeling of fluid flow, creating the practice of computational fluid dynamics (CFD) in industry, and paving the path for the widespread application of CFD to the design of objects from airplanes to heart valves. Professor Brian Spalding sent this message to CHAM Japan in 2014 when he was unable to attend a meeting in Tokyo. In it he describes how CHAM Japan originated.